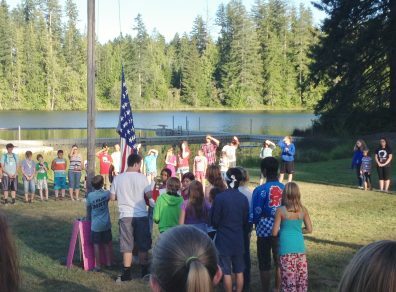 Mason County 4-H Youth Development offers a variety of camping programs for 4-H members. Campers have been enjoying the beauty of Panhandle Lake 4-H Camp for over 60 years! This outdoor paradise includes forest, wetlands, and facilities to accommodate camping programs, retreats, and natural resource education. A lodge, dining hall, dormitories, Yurt, equestrian facilities, and Adirondack style cabins make Panhandle an ideal location for recreation and education. To learn more about Panhandle Lake Camp click here. 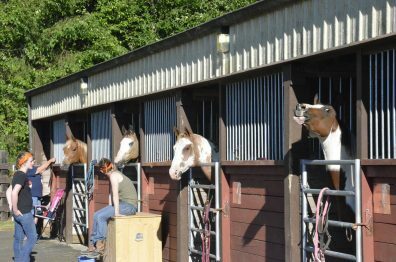 4-H members enrolled in the Horsemanship project enjoy a week of overnight camping, education and recreation with their horses. Camp is packed full of educational workshops, fun camping traditions, and memories that will last a lifetime. The 2019 Horse Camp runs June 22-27. Members enjoy a week of equitation, showmanship and western games classes, trail rides, craft projects, and fun outdoor activities. 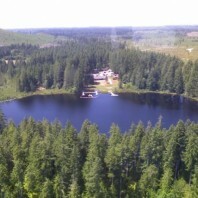 Camp is held at beautiful Panhandle Lake 4-H Camp, a 400 acre tree farm located just outside of Shelton Washington. Panhandle amenities include modern dormitories, a 38 stall barn, riding arena, miles of trails, commercial kitchen and dining hall, a rustic lodge and beautiful lakefront areas for swimming. Please consider joining us for a week of fun and learning with your horse. Camp will be limited to the first 30 paid in full registered campers. Registration will open Spring 2019. ALL REGISTRATIONS WILL BE DONE THROUGH YOUR 4HOnline PROFILE. For additional information contact Camp Director Melissa Seals 360-280-5458 or the Extension Office 360-427-9670 Ext. 681. Discover yourself at 4-H Summer Camp! If you are looking for some adventure blended with a traditional camping experience 4-H camp is for you! Campers spend the week enjoying a myriad of activities, including swimming, hiking, arts, music, cooking, and making new friends! Awaken to birds singing and fall asleep to the stars (or exhaustion). Bring your positive energy and your sense of adventure! Camp runs July 21-25, 2019. ALL REGISTRATIONS WILL BE DONE THROUGH YOUR 4HOnline PROFILE at http://wa.4honline.com. For helpful registration instructions visit https://s3.wp.wsu.edu/uploads/sites/2064/2019/03/Summer-Camp-Registration-Instructions.pdf. Download the Summer Camp Information Packet for parent information and additional details. For more information contact Camp Director Leanne Gunter 360-490-8793 or the Extension Office 360-427-9670 Ext. 681.